Home / Android / Phone / Security / TECHNOLOGY / Vulnerabilities / 8M users installed adware apps from Play Store ! 8M users installed adware apps from Play Store ! Google is yet to boot from the Play store another batch of fake apps built only to show advertisements on users' devices. A researcher has uncovered nine of them, with a total install count of over eight million.This is the second time in one week that adware apps have been found on Google Play Store. Among the most in-demand of this set of offensive apps are four with over 500,000 installs from the official Android store, one with over one million, and another that shows a whopping five million installs. Lukas Stefanko, an IT security researcher at ESET has discovered 9 Android apps on Google Play Store spamming users with unwanted ads. One of the apps called “Remote control for TV and home electronics” has been installed by more than 5 million users while in total all 9 apps have been installed by 8 million users around the world. According to Stefanko, none of the apps actually work and their sole purpose is to bombard users with ads to generate revenue for app developers. It is noteworthy that these apps have been developed by Tools4TV, an Android developer that has been active since 2015. The unwanted code is hidden in “not working” apps that once launched, hide itself from user’s view and display ads. All these apps are fake without any promised functionality, said Stefanko. 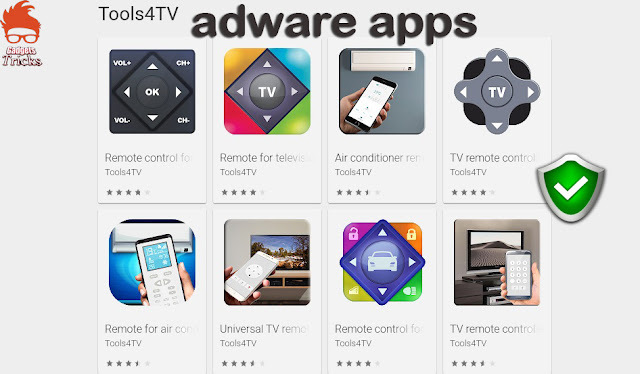 the IT security researchers at Trend Micro revealed that there were 85 adware infected apps on the marketplace bombarding around 9 million Android users with full-screen unwanted ads. All 85 apps (developed by two different Android developers “Alger games and Kodev”) were then removed by Google however it is unclear whether there is a connection between apps reported by Trend Micro and Lukas Stefanko. At the time of publishing this article, Google has booted out Tools4TV along with their apps from the Play Store. To protect yourself from malware and adware apps avoid installing unnecessary apps from Google Play Store or from a third-party marketplace. We suggest sticking to trusted developers and brands and only download an app after going through its review section.